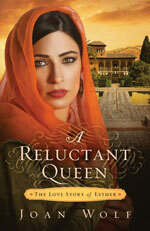 When I first heard about this book, A Reluctant Queen, I was not very interested in reading it. Yes, you could say I was ‘reluctant’. Why? Because I have heard the story of Esther many times; I can read the ‘real thing’ in the Bible any time, and another version just sounded boring. So, why did I pick it up and read it? One, I read a couple of favorable reviews from readers I respect on goodreads.com; and, two, I had read some historical fiction by Joan Wolf years ago and really enjoyed them. So, I decided to give A Reluctant Queen a try. Since I’m taking the trouble to write a review here, you can probably guess by now that I enjoyed this book and highly recommend it. It is historical fiction, so don’t take the few liberties Wolf takes with the story disturb you. She does a very good job of giving reasons for Esther being sent by her Jewish uncle to enter the Persian king’s beauty contest. She may or not be right, but it’s a question I always have when I read the story, so it adds a new dimension to the story. She brings the characters to life, giving them personalities and filling in some of the historical background, making the story believable and interesting.